Sonal Hattangdi-Haridas leads a workshop on homeopathy for the family. Tomorrow, 2pm-5pm, Integrated Medicine Institute, 17/F Kailey Tower, 16 Stanley St, Central, HK$700 (US$88). Renee Claire and Rosina Maria Arquati lead a weekly meditation and channelling group. (Tuesdays), 7.15pm-9pm, New Age Shop, 7 Old Bailey St, SoHo, HK$150 (US$19). When Bart Sibrel, who claims the NASA Apollo Mission moon landings were faked, accused Edwin “Buzz” Aldrin of being “a coward and a liar”, well, I guess he pushed the right buttons. While I do not condone violence, the reaction of Buzz Aldrin is understandable given his heroic and historic achievements, his societal values from an older generation (he’s 79 years young), and the “in-your-face” menace of a wannabe filmmaker. No matter whether one is a hero or everyday journeyman, when someone is continuously harassed and falsely accused by some idiot of being “a coward and a liar”, frustration can boil over. In this case, Buzz Aldrin knows the facts (and there is ample evidence of Man’s achievement in landing on the moon … see related links below). And Buzz is being harassed and challenged by someone who has an opinion. Facts and opinions are different levels of evidence, with the former always trumping the latter. As I have mentioned before, science does not work like democracy … when there are facts, opinions (whether popular or unpopular) can easily be rejected or at least revised. 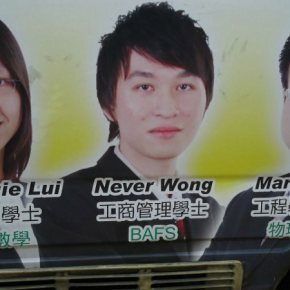 Last month, when Edwin "Buzz" Aldrin, 79, visited Hong Kong I heard a quote on a TVB news clip (June 19, 2009). 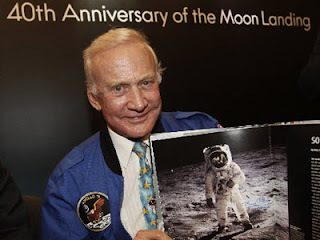 Buzz was asked to describe, and not for the last time, how he felt about the moon landing (or being in space), and he graciously and humbly replied that he had a feeling both of "magnificence and desolation". Perhaps "Magnifisolation" should be a future term to add in the dictionary? Definition: a profound feeling of utmost brilliance mixed with unbound bleakness. In celebration of the Apollo 11 40th Anniversary of the First Manned Mission to the Moon. 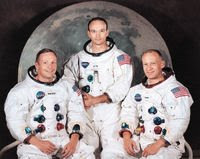 [NASA Apollo 11 Mission Crew: Neil Armstrong, Michael Collins, Edwin Aldrin] from Wikipedia. This blog received an interesting and irrational comment (see below or here) recently in response to Hong Kong Dismissing Creationism and Intelligent Design. The comment basically said that individuals can decide what is truth or real or fact, based on what “feels right to them”. It really is unfortunate and sad that some people feel and “think” this way about evolution and science. I suspect these people are religiously indoctrinated and are desperately pushing for creationism and intelligent design, although they find it hard to admit this openly. They think “what feels right to them” is the answer. Well, it is not the answer. It’s not credible and it’s not scientific. For instance, if I show someone a fish, and I demonstrate to them all kinds of supporting evidence to indicate that it is a fish, I do not expect someone to say: “well, I feel like, I dunno, like it’s not a fish, y’know, like. It’s feels like it’s a rabbit, like. I’m free to decide by myself, and I say like it’s a rabbit, like.” These kinds of people are truly delusional. Science does not work like democracy. You can’t vote and decide that a fish is a “rabbit” simply because you decide it “feels right to you”. The fact (and I mean, the scientific fact) is that a fish is a fish, and science does not care what individuals “feel” about the fact. Regardless of how people “feel”, creationism and intelligent design are in fact pseudoscience and therefore do not belong in science. There is strong evidence to support evolution. There is NO evidence to support creationism and intelligent design. It's hard to say what to do. I think you should offer people/students all the 'opinions' on the given subject and let them decide what feels right to them. I think it is wrong to force either the scientific, or the spiritual explanation on to someone, but a conbination of all should be 'offered'. John Fyfe leads a Vedic astrology workshop. Feb 10, 7pm-9.30pm, Shakti Healing Circle, 3/F Waga Commercial Centre, 99 Wellington St, Central, HK$560 (US$70). 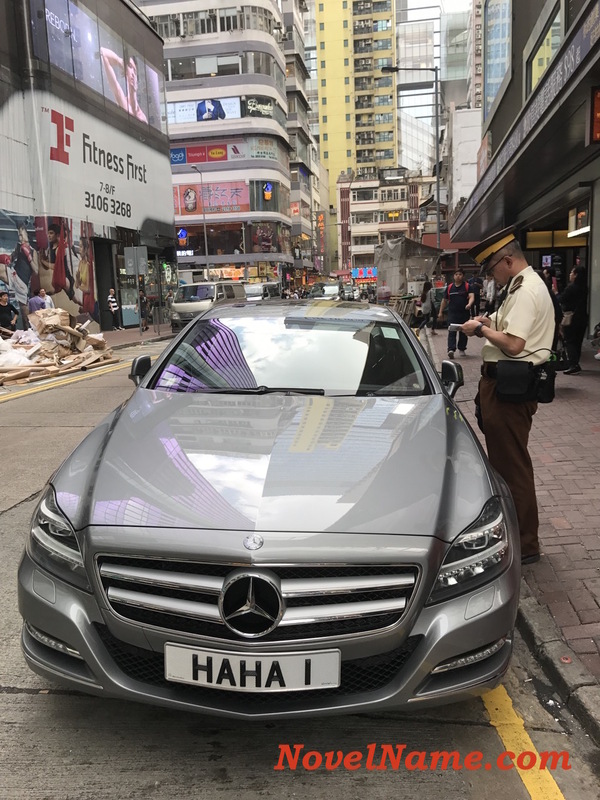 I was prepared to overlook the distaste, poor reasoning, and trite humour from the Hong Kong Standard’s columnist (below) but I could not ignore the blundering attempt at grouping south Asians with Black African-Americans. I don’t know anyone (except for this columnist) who has referenced Michael Jackson as a “brown” man. South Asians, or people with a trace of South Asian blood, sometimes regard themselves as brown, but to say Wacko Jacko is brown? How silly. The autopsy of Michael Jackson will produce shock results for sure. Forensic pathologists will open a white guy's body and find a black guy inside. One wonders which Michael Jackson will be immortalized in statues. The nice young man with the Afro? Or His Royal Weirdness with the wig-like flowing locks and detachable nose? Which nose will sculptors recreate? The one that collapsed, the one made out of ear cartilage, or a random one from the biscuit tin under his bed? Commentators keep talking about Jackson's contribution to race relations, but, with all due respect (ie, none) they are talking garbage. When the Jackson Five made their breakthrough in the 1970s, many people (including me) celebrated. For the first time, people with brown skin, black hair and big noses were entertainment superstars so big that there was a shockingly bad cartoon series made about them. In the 1970s, this was the ultimate sign of success. If brown people could appear in execrable cartoons, we could do anything. I realized that I no longer had to content myself with aspiring to be a waiter in a small cafe where no one goes. I could be a MAITRE D' in a small cafe where no one goes. At last, something to aim for. In gratitude, I bought several copies of Off the Wall, Michael's first big hit album. Later, I got a job in a cafe in Hampstead, London. The manager assigned me to permanent washing-up duty. This was even more menial than waiter. "Brown people are capable of greatness," I complained, giving him a cassette of Off the Wall. "Have you heard this?" The manager, whose heart and brain were twin lumps of coal, replied: "Jacko ain't brown anymore. Check it out." During my lunch break, I bought a copy of Melody Maker. It was true. Jackson had dyed his skin white. I was so shocked I threw my sandwich into the waste disposal and kept the wrapper. How could Jackson, supposedly blazing a trail for brown people, abandon us? But the following day, Jackson told his fans that he'd contracted a weird skin disease which had turned him white. I believed him. Then some time later, the manager showed me a picture of Jackson with white skin, Kirk Douglas' chin, an upturned Caucasian nose, and long, flowing hair like Elizabeth Taylor. For a day or so, I postulated the existence of a rare disease which whitened your skin, did cosmetic surgery on your nose, gave you a Kirk Douglas chin, and made your hair long and wavy. Hero- worshippers like me put years of practice into fooling ourselves. But this time, I failed. Jackson had left his brothers. Not just Jermaine and gang, but his brothers all over the world. This once- brown boy devoted the rest of his life to reshaping himself in various ways with teams of surgeons. He probably tried having eight legs or two heads. But the easiest thing to fix - his skin tone - stayed lily white. He let us down. If he hadn't, I could have made it. I could have been a waiter.